My first afternoon in San Francisco I did the most touristy thing of all and went to see the Golden Gate Bridge. I planned out prior to my trip that I wanted to go across the bridge leaving the city, see the bridge from two of the overlooks on the opposite and then walk back across. Unfortunately I didn’t land in San Francisco until almost 4 PM so that really wasn’t going to give me much time to see it before it got dark. I also had no clue if I would be in San Francisco again at this point so I wanted to take full opportunity. Since I was staying downtown, I had to find a way over to the bridge and back. When I looked up how long a ride and how expensive a cab or Uber would cost I realized I was too cheap spend that much. Renting a car wasn’t any more realistic and difficult on a Sunday afternoon. I settled on taking the bus. Many people won’t do public transportation in a strange city, but when you think about it, it’s no more risky than public transportation in a city you know. I was able to get the bus a few block from the hotel. After a cross town and cross bridge bus ride I arrived at the first overlook, Vista Point. Every tourist from everywhere stops at this overlook. There were a ton of families, lots of selfie sticks and a ridiculously long line for parking. Now I don’t consider myself a bridge aficionado, this is truly a beautiful bridge. Such great ironwork, how the bridge’s height just towers over you and the color choice really makes it stand out for a reason I’d see shortly. This vantage point kept me almost level with the bridge. It really allows you to see how tall the bridge stands. When done at Vista Point, I walked up a steep hill to the Battery Spencer overlook. I was exhausted and out of breath by the time I got there. Most people drive this ½ mile hill. I walked up it not realizing it would be about a 30 degree incline. This vantage point gives the ability to look down on the bridge. You can really see the length of the bridge and just how much it is covered in traffic at this level. From here I took my rare selfie as well as asked others to take some photos of me. This was one of those occasions where the selfie looked better as the other photos I looked sweaty, fat and exhausted opposed to just windblown and disheveled. Unknown to me, at this time of day the fog was really beginning to roll in. I never knew the weather changed so much in the evening in San Francisco. The top of the bridge was starting to get covered in clouds. Without looking up any history about the bridge, I assume this is one reason it is that reddish orange color. I started down the hill and on my walk back across the bridge toward the city. I kept stopping every few hundred feet to take in more of the bridge. The bridge is over 2 miles. This really added to my time getting across. Earlier in the day I could probably see clear down the bay from the bridge. By the time I was crossing, the clouds were already rolling in heavy. It was almost dark by the time I got back to the San Francisco side. I took some more photos from this angle. From the San Francisco side, you really get a good impression of just how large is the Golden Gate Bridge, but from below the bridge. I would really recommend seeing the different angles. After dusk turned to night, I decided it was time to find the bus back. Complicating the trip back a little is finding the correct bus stop. There are 3 bus stops over there to head back to the city and luckily I picked the right one on my second guess. 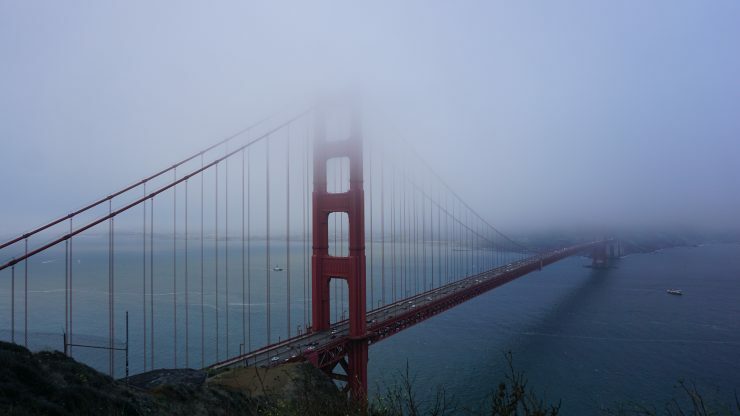 I found myself thinking about why the Golden Gate Bridge is such a tourist attraction while the similar George Washington Bridge. Maybe it’s different to me since as a child it was a bridge my family crossed regularly. Finally around 9 PM I returned to a nearly empty Downtown San Francisco tired and ready for dinner and bed.